Japanese cuisine is famous for its simplicity. There are only 5 essential Japanese seasonings and condiments. Japanese dishes generally use a mix of these. These bring out the natural flavour and create a sophisticated taste in the ingredients. You probably have been wondering what seasonings and condiments I keep in my pantry. Learn about each of these Japanese seasonings and condiments to cook as Japanese do! There is a pun to remember the 5 Essential Japanese seasonings and condiments. These are called the “Sa-Shi-Su-Se-So seasonings”. Have you ever learnt the Japanese language? I teach the Japanese language at a local state high school. Usually the beginner Japanese learners start to learn Japanese with 46 basic sounds and Hiragana scripts using a chart. SA, SHI, SU, SE, SO are one of the sound lines which is a pun of 5 basic seasonings of Japanese cooking. Sugar make the best use of its characteristics in Japanese cooking. For example, sugar keeps starch soft, and so Japanese sweets such as daifuku and yokan stay soft. Also when you make Tamagoyaki, adding sugar increases its solidification temperature, therefore, the eggs become solid gradually which creates a fluffy and smooth texture. Types of sugar generally used in Japanese cooking are Johakuto, Guranyutou, Koorizatou, Sanontou, Kurozatou, and Kibizatou. Johakuto is a white sugar. It is common and made from sugar cane. Guranyutou is equivalent to caster sugar. Koorizatou is rock sugar, also made with sugar cane. Sanontou is made from a refined caramelised white sugar. Kurozatou is raw brown sugar so where a recipe calls for Kurozatou you can replace it with dark brown sugar or muscovado sugar. Satoukibi is cane sugar, light brown in colour. 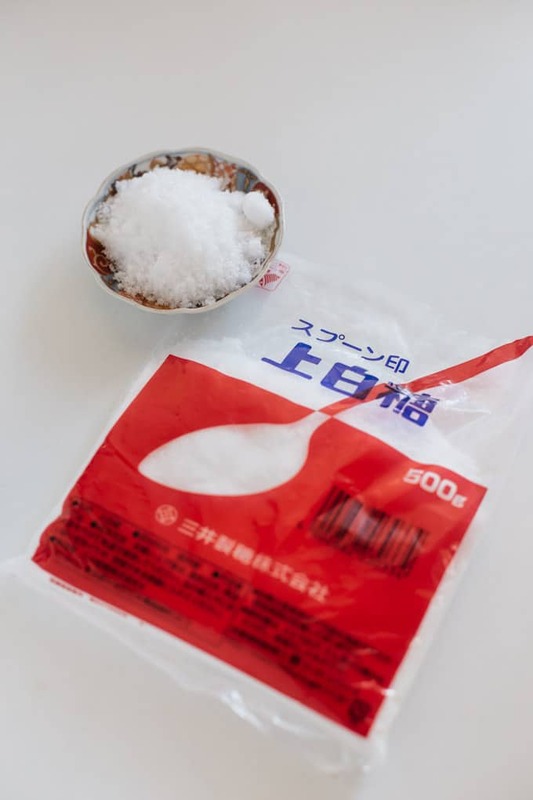 There are many different varieties of salt available in Japan. 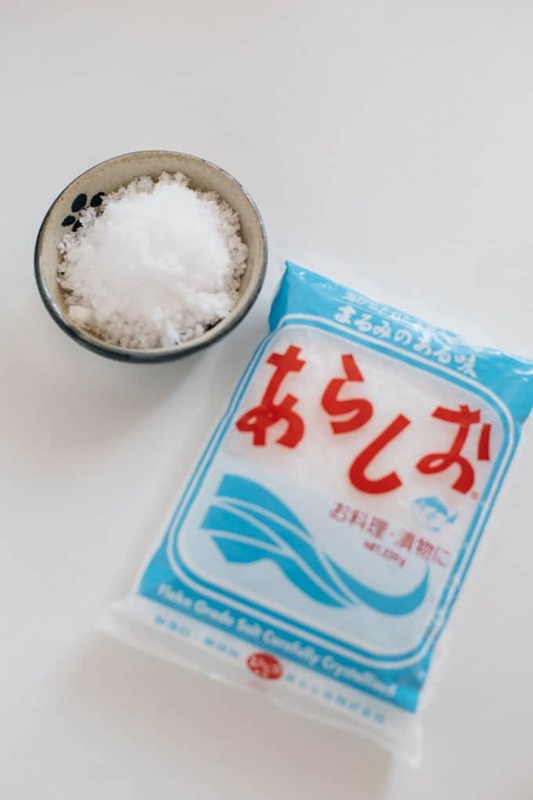 The salt produced in Japan is mostly made from salt water. The proportion of sodium chloride, amount of bittern, manufacturing methods and processing creates different salts. Now, because larger sized grains of salt dissolve slowly, it gives a more mellow taste. And quickly dissolving smaller grain salt makes food taste saltier than larger grain salt. Salt has a dehydrating effect, and it increases elasticity. It also has a contrasting effect of complementing other flavours and preventing oxidation and discolouration of food. For example, sprinkle salt over sliced cucumber when you make Japanese cucumber salad and it draws liquid out of the cucumber using the function of osmotic pressure. Also add salt to vinegar when you make sushi rice vinegar, in order to make the sharp vinegar taste mellow. The most ancient seasonings are vinegar and sake. Vinegar is made from grains such as rice or burley, or from fruit such as apple. 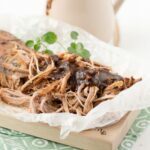 It can be used for increasing sweetness, complementing saltiness, and even stopping fish from falling apart when it is simmered. The acetic acid in vinegar also has an antiseptic effect. Soy sauce is Shouyu in Japanese. However, the correct reading of 醤油 is Se u yu or Sha u yu which is soy sauce, hence se is for soy sauce. 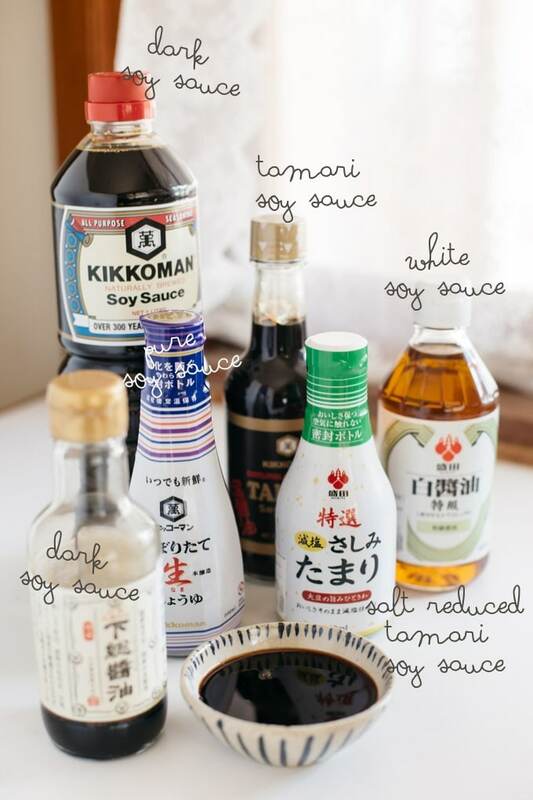 The type of soy sauce is classified according to Japanese agricultural standards. There are five categories; dark, light, Tamari, twice brewed, and white soy sauce. Unless a recipe specifies which soy sauce to use, if a recipe calls for a soy sauce, use dark soy sauce. Koikuchi (dark) soy sauce contains approximately 16% of sodium. Although Usukuchi (light) soy sauce is lighter brown in colour, it contains 2-3% more sodium. 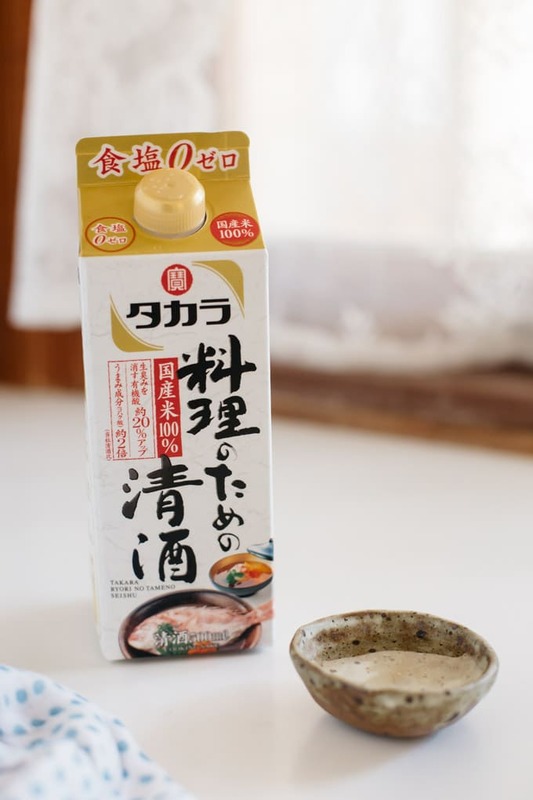 I use Usukuchi (light) soy sauce for simmered vegetables and Chawanmushi. Tamari soy sauce is much thicker and richer than the other soy sauces. This is because it contains a high percentage of soy beans. Saijikomi (twice brewed) soy sauce is as the name suggests, brewed twice. It is darker in colour generally and contains about same amount of sodium content as Dark soy sauce. White soy sauce has a colour similar to a light beer. Its sodium content is about 17-18% and is used in fine Japanese cuisine. I love miso and make my own. 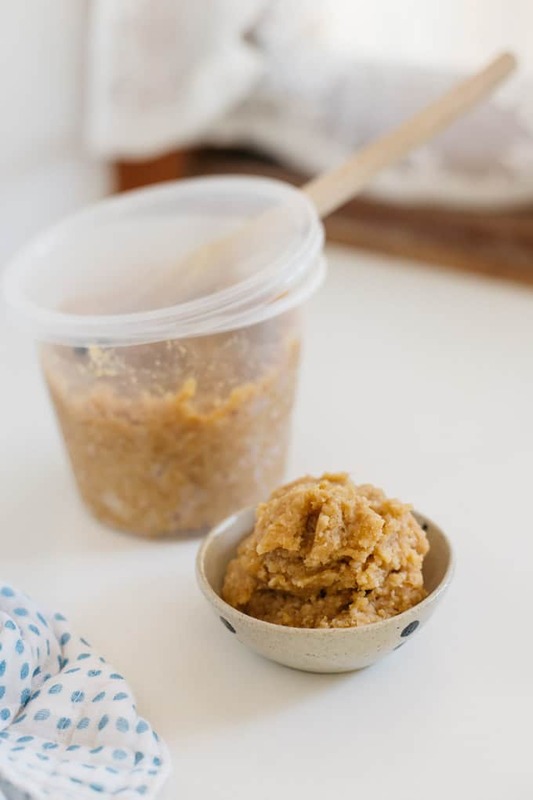 If you have been following Chopstick Chronicles, you know I have shared how to make your own Miso. 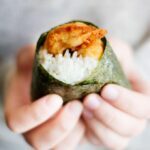 So if you would like to know more about Miso, please read my Miso post. So now that you know the 5 Essential Japanese seasonings and condiments, we need to look at the order in which you would use these. Sa-shi-su-se-so is also the order of seasoning in Japanese cooking. 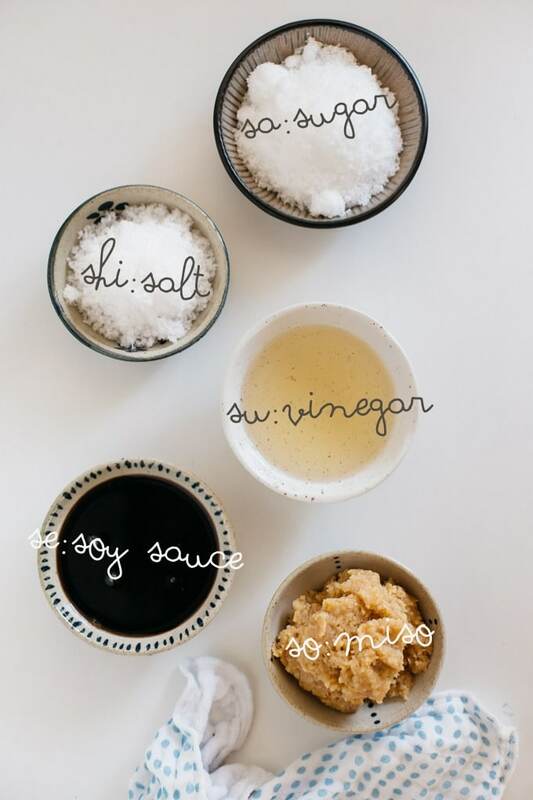 For example, if a recipe calls for sugar, soy sauce and vinegar, then you need to add those condiments in the following order: sugar(sa), vinegar(su) and soy sauce(se). It is based on the following three reasons. For example, Sugar should be added before both salt or soy sauce. Because sugar’s molecule is larger and it’s osmotic pressure is lower than salt and soy sauce, if you add salt or soy sauce before sugar, it will be hard for sugar to penetrate into ingredients. 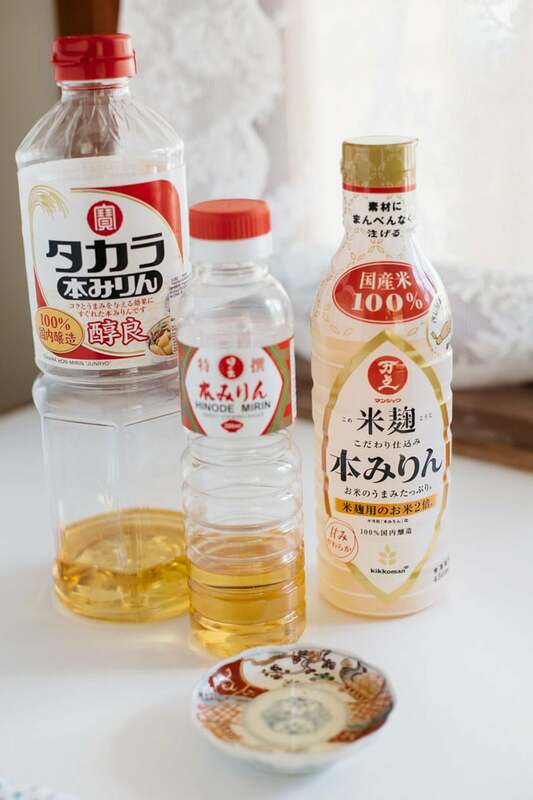 Vinegar or Miso will lose their flavour if they are added too early. 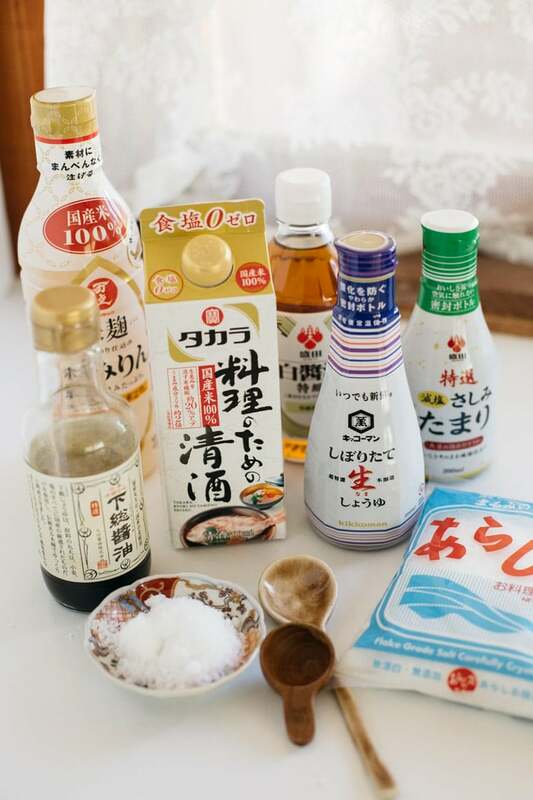 Sake and Mirin are also important condiments in Japanese cooking. Sa is also for Sake as well as for Satou:sugar. So when should we add Sake and Mirin? Both have the effect of advancing seasoning and also they reduce the smell from certain ingredients such as fish. Because of the alcohol content, they need to be added early in the cooking process. You need to be careful when you purchase Mirin for cooking. 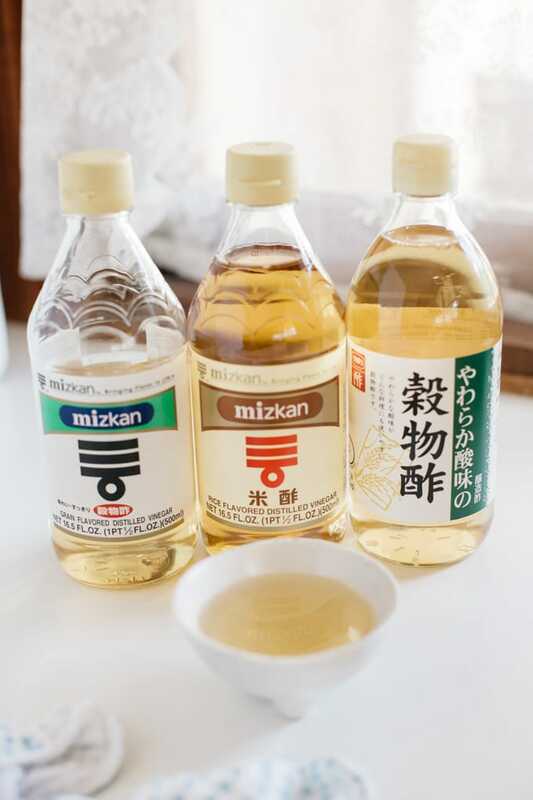 There is a Mirin that does not contain alcohol, it needs to be added at the end of the cooking. All 5 Essential Japanese seasonings and condiments are available from major supermarkets in Australia except Miso. If any Asian or Japanese grocery store is nearby, you can get them all from those stores. Of course, you can also purchase these from online shops such as Amazon. Thanks for this post Shihoko! While I have a general knowledge of these 5 essential seasonings, your in-depth descriptions are very helpful. I have some form of these 5 seasonings but knowing how, when and why they are used is invaluable! 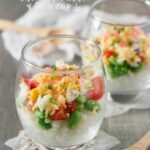 I’ve learned so much from your blog and try to incorporate your pearls of knowledge when I can in my cooking. Rock on and keep sharing! I appreciate your dedication to your heritage! Again, thank you for sharing! Hope 2019 was been great for you so far! Thank you so much for providing this valuable information! I always learn so much from your blog. I am keen to expand my knowledge of Japanese cooking further. Trust you have had a pleasant Sunday! Hi Alexandra 😀 you are welcome and thank you for reading Chopstick Chronicles.